IOCCG’s main decision making body is the IOCCG Committee consisting of about 30 members drawn from the ocean-colour community (rotating membership) and national space agencies (appointed by agencies). The committee meets annually to coordinate the activities of the group as a whole, and decide upon policy, new scientific working groups, training initiatives and other IOCCG activities. The IOCCG Executive Committee consists of the Chair and past-Chair (each serving 3-year terms) plus representatives from the sponsoring agencies. The Executive Committee usually meets twice per year to discuss financial matters, membership, and all matters concerning IOCCG’s s work between Committee Meetings. The International Project Office is currently based at the Bedford Institute of Oceanography, Canada, staffed by Project scientist, Dr. Venetia Stuart. It is the main contact point and provides support for all IOCCG activities, and facilitates communication both within and outside the project. 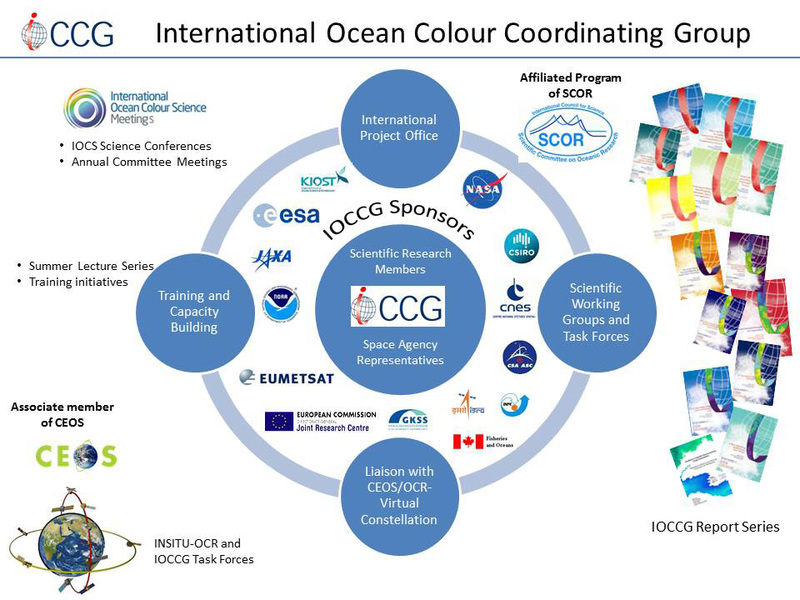 The implementation of IOCCG is facilitated by its scientific working groups established to investigate narrowly focused topics related to ocean-colour technology and its applications. The work is intended to be completed within 2-3 years, resulting in the publication of a report in the IOCCG Report Series. IOCCG has established several semi-permanent “Task Forces” to address issues that require an ongoing capability and/or expertise, and to facilitate inter-agency collaboration.